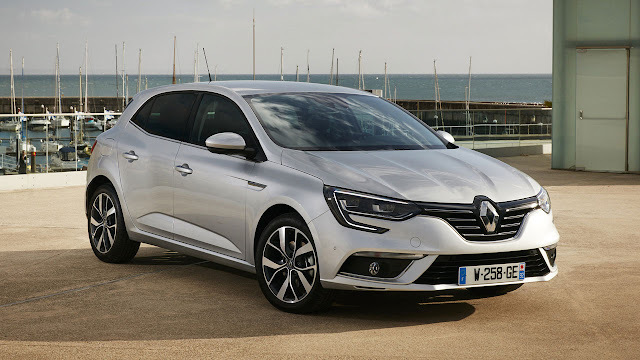 Renault has announced further details of the All-New Mégane line-up following its global debut at the 2015 Frankfurt Motor Show and ahead of the vehicle going on sale in European LHD markets from early 2016. 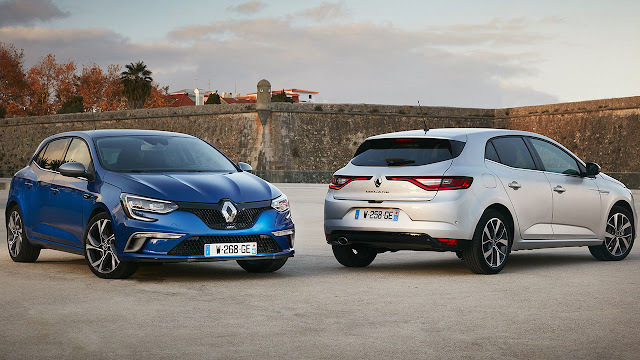 All-New Mégane is the fifth Renault to be built on the Renault-Nissan Alliance's new Common Module Family (CMF) vehicle architecture, after the Espace, Kadjar, Talisman saloon and Talisman estate. The CMF platform is a highly flexible method of building cars with great efficiency, high levels of automation and exceptional quality. It also allows technologies from upper-segment cars to be made available in less expensive models more affordably. Unique-in-class features which will be offered in All-New Mégane include a colour head-up display, a configurable 7-inch Thin Film Transistor (TFT) colour instrument display, R-LINK 2 connectivity systems via either a 7-inch landscape or 8.7-inch portrait tablet, Multi-Sense technology to personalise the driving experience and, on the GT version, 4Control four-wheel steering. All-New Mégane carries on the design revolution which has been taking place at Renault through recent model introductions like Clio, Captur, New Espace, Kadjar and Talisman. It is longer and lower than the outgoing model, with a longer wheelbase and significantly wider front and rear track widths – now the widest in class – to give it even more dynamic and balanced proportions. The taut, precise appearance of the car is emphasised by broad, sculpted shoulders and wheels of up to 18 inches in diameter tightly encased by the bodywork. The narrow wheel clearance has been made possible by completely revised suspension geometry and more angled dampers. All-New Mégane has distinctive front and rear lighting signatures which are permanently lit when the engine is switched on. At the front, the C-shaped are made up of 3D-effect LEDs. Upper trim levels have full LED headlights using Renault's LED Pure Vision technology, with automatic switching between main and dipped beam. The rear lights use Edge Light technology to create a horizontal 3D-effect which appears as brush strokes with a deep red glow. All-New Mégane has a similar cabin ambience to New Espace and Talisman, and reflects the same craftsmanship through its high-quality, soft-touch materials – including full-grain Nappa leather steering wheel trim – chrome detailing and foam-backed dashboard, armrests and door panel trims. There is an unmistakable cockpit feel to the car thanks to the design of the centre console and instrument panel containing the multimedia tablet and 7-inch TFT display, and the sculpted, accommodating seats. These provide high levels of comfort and support through the use of dual-density foam and identical frames to those found in New Espace and Talisman. The five upholsteries, all in black, have been inspired by leather goods and stylish furnishings. Discreet top-stitching on the seats and door panels further underlines All-New Mégane's quality, while the driver benefits from a heated seat and electrically adjustable lumbar support. The sporty and dynamic appearance of All-New Mégane is even more evident on the GT-Line versions, which feature visible exterior and interior enhancements. At the front there is a wider lower air intake with a honeycomb-pattern mesh, flanked by lateral scoops. An elliptical chrome exhaust tailpipe and a profiled diffuser hint at the car's sporty character and there are dark metal 17- or 18-inch alloy wheels and door mirror housings to match the finish on the front air scoops and rear diffuser. GT-Line badges adorn the front wings and rear. The front seats feature additional lateral support and integrated headrests, blue top stitching and a chequered logo. The three upholstery options, in fabric or Alcantara, have blue or black stripes, and there are other hints of blue in the trim strips, all reflecting the Iron Blue body colour. All-New Mégane GT-Line also receives a bespoke steering wheel offering a firmer grip, and model badging on the dashboard. An advantage of the Alliance's CMF architecture is that it allows advanced and previously expensive technologies to cascade across model ranges more affordably. 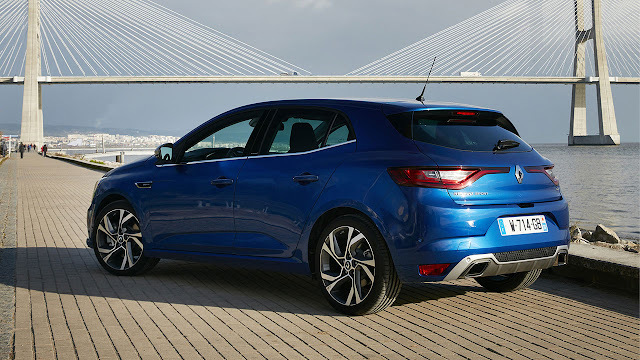 As a result, All-New Mégane is able to offer a package of unique-in-class technologies from New Espace and Talisman. Higher trim levels have the R-LINK 2 multimedia control centre featuring an 8.7-inch portrait display which can be operated with pinch and zoom movements, just like a smartphone or tablet. It includes voice recognition for the navigation, telephone, apps and radio and is linked to larger loudspeakers than those in the previous Mégane, better-positioned at the foot of the doors. The benefit is especially noticeable with the Arkamys sound system. There is also an optional (depending on final market specifications) Bose system developed with Renault which features nine speakers and a subwoofer to deliver every nuance of the original recording. A totally individual driving experience is offered by Multi-Sense technology, which allows drivers to personalise the accelerator pedal and engine response, engine sound, steering weight and interior lighting ambience through a choice of five colours, plus – where fitted – the speed of the gear changes through the Efficient Dual Clutch (EDC) gearbox and even the driver's seat massage function. The use of the CMF platform also makes available a whole range of Advanced Driver Assistance Systems (ADAS) to improve safety. They include Adaptive Cruise Control; Active Emergency Braking; Lane Departure, Blind Spot and Safe Distance warnings; Overspeed Prevention with Traffic Sign Recognition; Automatic High Low Beam; Hands Free Parking; and 360 degree parking sensors. In the All-New Mégane GT there is also the unique-in-class 4Control all-wheel steering system, designed to increase the precision and responsiveness of the car while adding an extra layer of cornering stability. It has been developed by Renaultsport engineers, who have also devised specific settings for the car's suspension plus Launch Control and Multi-Change Down capability incorporated within the EDC transmission. Depending on the country, All-New Mégane will be available with 10 fuel-efficient, low-emission powertrains in line with Renault's downsizing strategy. All but one of them is turbocharged and two are exclusively reserved for the GT. There are four Energy TCe turbocharged petrol options with capacities and power outputs of 1.2 litres/100hp, 1.2 litres/130hp (manual and EDC) and 1.6 litres/205hp (GT). The turbodiesel alternatives are 1.5-litre dCi 90 and 110hp units, the latter with manual or EDC transmission, and 1.6-litre dCi units developing 130 or 165hp. With the benefit of turbocharging they produce high torque outputs from low engine revs, ensuring outstanding driving flexibility while minimising fuel consumption and CO2 emissions. The CO2 of the manual dCi 110 is just 86g/km, while at the other end of the scale the TCe 205 GT will be capable of 0-62mph in 7.1 seconds and a top speed of more than 145mph. And it will not stop there. In 2017 a Hybrid Assist diesel-electric powertrain will be added to the range, based on the Energy dCi 110 unit. Renault is targeting a class-leading CO2 figure of 76g/km, with fuel economy in the NEDC combined cycle of more than 97mpg. The Hybrid Assist is provided by a 48-volt battery which is topped up by energy recovery under deceleration and braking. The diesel engine remains in operation at all times. In certain markets, the entry-level engine will be the SCe 115 – a naturally aspirated 1.6-litre unit developing 115hp and 156Nm of torque. While the GT's ride and handling benefit from the Formula 1 experience of Renaultsport engineers, all versions of All-New Mégane are precise and responsive while still being supple and comfortable thanks to extensive work on the suspension dampers, bump stops and bushes as well as the steering. Refinement is also significantly better thanks to a stiffer body shell, thicker window glass, improved door seals and greater use of foam and felt in areas where road, wind or powertrain noise could be transmitted into the cabin. The new model is the latest in a line stretching back 20 years. Total sales now surpass 6.5 million worldwide, including 1.5 million of the outgoing Mégane.